The most surprising thing about the Pixel, the first smartphone designed entirely by Google, is that it didn’t launch sooner. Having developed the world’s most popular mobile operating system, the Mountain View giants are the obvious candidates to get the most out of it. Google aren’t holding back with the Pixel: they claim it has the best smartphone camera ever, a claim backed up by image quality website DxOMark Mobile – they’ve scored it 89/100, their best score to date. The 12.3 megapixel rear camera is designed to offer sharp, beautiful images even in low light. It has an f/2.0 aperture and 1.55 micron pixels, which is photography-speak for ‘it takes excellent photos even if you aren’t that good at photography’. It also includes some special effects, like Smartburst, which takes rapid fire photos of action and picks the best for you, and Lens Blur. Of course, what everyone really wants to know is how good it’s going to make them look in selfies. Answer: very good, because it has an 8 megapixel front-facing camera. Ever since Siri hit the scene, we’ve dreamt of being able to converse with our virtual assistant like a real person rather than a phone pretending to be a person. While Assistant, the… erm, assistant built into the Pixel, won’t be able to chat about the football or the weather beyond scores and forecasts, it can understand context and how follow-up requests relate to your original question thanks to AI wizardry. For example, if you ask Assistant to show you film times, you can follow it up by mentioning that you’re bringing the kids; Assistant will then narrow down the times further. Assistant can also read what’s on your screen, but not in that irritating way people on the bus do. Instead, it can perform actions based on what you’re looking at. So, if someone mentions meeting at a certain bar, you can say ‘navigate there’ and Assistant will give you directions. Depending on the phone you own, you could receive Android updates as soon as they’re released or in a year’s time. You may not receive them at all. It’s one of the major problems with Android, and one Google is going to fix with the Pixel. As well as shipping with a pure version of Android 7.1 Nougat, Pixel users will also receive software updates as soon as they’re ready. There’s no way of getting around it: the Pixel looks quite a lot like the iPhone 6. It has a similar aluminium build and there are two models too: the standard Pixel with a 5” 1080p screen and the Pixel XL, which has a 5.5” Quad HD display. There are some differences, though, the fingerprint scanner being one. Instead of sitting below the screen, it is positioned on the back of the phone for easy access. It also has a USB-C port for data transfer and fast charging. Apparently, you can get seven hours of battery life from 15 minutes of charging, which is mighty impressive. The Pixel packs a lot of power in its sleek frame, with a Qualcomm Snapdragon 821 processor (read: really fast) and 4GB of RAM. There are two storage options to choose from, 32GB or 128GB, but Google has an ace up its sleeve; every Pixel user gets unlimited photo and video storage. 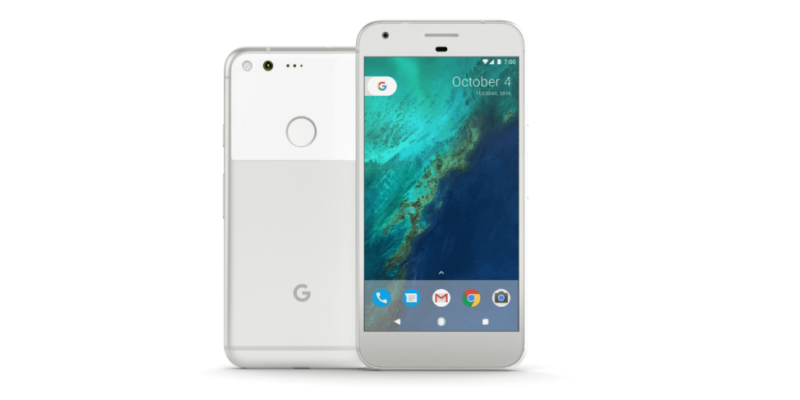 Are you thinking of buying a Google Pixel? Sell your Samsung Galaxy, iPhone or any other mobile today and upgrade! It’s simple: get an instant price, send your phone for FREE and we’ll pay you the same day it arrives.